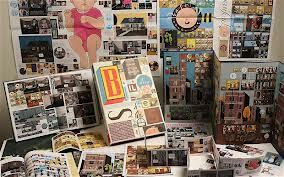 Last post I focused on the spaces in Chris Ware’s book-in-a-box called “Building Stories,” and the way that those spaces bring the reader into the story. I could write about Ware for the next few months, but for now, since I’ve already made the case that Ware’s work is as significant as literature like “Infinite Jest” and “Remembrance of Things Past,” I’ll discuss his significance within North American visual history, mainly by analyzing his work alongside the landscape paintings of Grant Wood. Fuzzy on who Grant Wood is? Here’s his best-known piece, “American Gothic,” from 1930.